Please see email sent on Jan 22. Parent Donation Sign UP Genius – thank you! 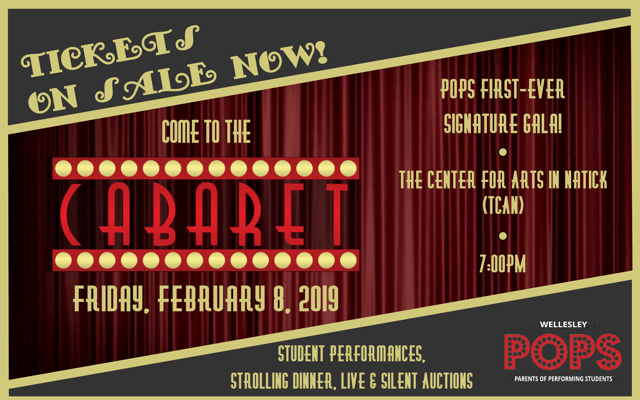 Wellesley Parents of Performing Students (POPS) invites you in our inaugural benefit event – POPS Cabaret 2019. This much anticipated gala will take place on Friday, February 8, 2019 at the The Center for Arts in Natick (TCAN). Guests will enjoy student performances, a strolling dinner by Baker’s Best, and live and silent auctions all in celebration and support of performing arts education and appreciation in our community. Reserve your tickets today: https://wellesleypops.ejoinme.org/cabaret. Proceeds from the Cabaret will support K-12 performing arts education and appreciation throughout our district. If you’d like to get more involved in planning this extraordinary evening, we’re looking for silent and live auction donations and volunteers to join POPS’ stellar gala committee. Be part of a magical night supporting performing arts in our community!